Call our dock builders for marine construction today! If you find yourself in need of marine construction and seawall construction services in Panama City, FL, make sure to contact Gorman Marine Construction Inc. Our experienced dock builders will be happy to provide you quality service for boat docks, boat lifts and more. No job is too big or too small. Call us today! Gorman Marine Construction Inc has been providing Panama City, FL and the surrounding Bay County area with quality service for over 30 years. Our highly trained technicians are equipped with the best technology to ensure the best quality job is performed to withstand the Gulf Coast weather. Safety and durability are two important features when building a dock and we make sure everything we build is safe for all to enjoy! Gorman Marine Construction Inc is the most knowledgeable marine construction company in the Panama City, FL area. Set off your waterfront property with a seawall, dock, or boat lift. We also offer dock repairs if your dock has been damaged. Living in the Panhandle puts your property at risk for hurricane damage, but with our dock builders around, you'll never have to worry! We offer a variety of marine construction services! We take a personal interest in all of our customers' needs, and accommodate our designs based on those needs. We only use the highest quality material while keeping our customer's finances in mind. We will gladly assist you with any questions or concerns you may have on upcoming projects. All of the members are well educated in the different processes and will be there working with you to answer any concerns. We provide free quotes on all services. Call (850)-769-7747 for a quote today. We assist our clients by providing a wide range of marine construction services. Our services include seawall construction, dock installation, dock repairs, and more. Our team has the right knowledge and experience to help you with your specific needs. We serve clients in Panama City, FL and the surrounding areas. We use the best materials in order to build strong and durable marine structures. If you have more questions about our marine construction services, call us today! We offer professional dock repairs! Docks and Piers: As experts in Florida pier construction and dock builders, we are able to give our customers the best possible dock for the best possible price. We work hard to make sure all of our customers are satisfied with our work. We build our docks and piers to suit Gulf Coast weather conditions, so they are able to last for years to come. As experts in Gulf Coast marine construction & seawall construction, RJ Gorman Marine takes special care to build piers and docks with materials that suit environmental conditions, while staying within budget for our customers. Contact our dock builders today for more information about our dock repairs! Marine construction of a seawall (bulkhead) requires quality materials, advanced technology, and experienced craftsmanship to prevent erosion and withstand strong winds and high waves. Our seawall contractors encourage the installation of vinyl seawalls over conventional materials for increased longevity and environmental protection. However, we understand commercial marinas or waterfront residences may require a seawall of stone, concrete, or specially treated wood and will be happy to accommodate you accordingly. From Jet Ski Davits and Boat Lifts, to commercial-grade industrial lifting devices, RJ Gorman Marine Construction will install the proper unit for your need. We will help you determine the best device for the area and situation and complete the installation, repair and service - giving you a turnkey package. Boat lifts are indispensable for extending the life of your precious craft. If you're in need of boat docks or dock repairs, don't hesitate Gorman Marine Construction Inc! We proudly serve Panama City, FL & Bay county. 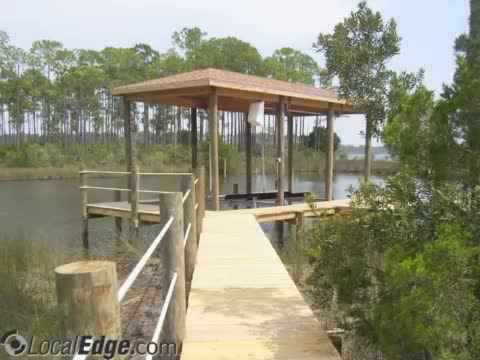 Give us a call today for all of your dock and pier needs. A friendly member of our team will gladly assist you! As experts in Gulf Coast marine construction, RJ Gorman Marine Construction Inc takes special care to build piers and docks with materials that suit environmental conditions, while staying within budget for our customers. Marine construction of a seawall (bulkhead) requires quality materials, advanced technology, and experienced craftsmanship to prevent erosion and withstand strong winds and high waves. We encourage the installation of vinyl seawalls over conventional materials for increased longevity and environmental protection. However, we understand commercial marinas or waterfront residences may require a seawall of stone, concrete, or specially treated wood and will be happy to accommodate you accordingly. Upland retaining walls for landscaping, pools, or patios. From Jet Ski Davits and Boat Lifts, to commercial-grade industrial lifting devices, RJ Gorman Marine Construction Inc will install the proper unit for your need. We will help you determine the best device for the area and situation and complete the installation, repair and service – giving you a turnkey package. Boat lifts are indispensable for extending the life of your precious craft. RJ Gorman Marine Construction Inc does municipal and residential channel markers and mooring pilings to Florida Navigational Standards. Repair work of existing docks is another specialty of RJ Gorman Marine Construction Inc, from removing/replacing old pilings, to re-framing and re-decking the existing structure.